You have probably noticed that a lot of my posts lately have been printables. Part of the reason for this is due to the fact that we are moving to a new apartment in a few weeks and I have packed up a lot of the apartment already and the second reason is that the budget during the summer months doesn't allow for a lot of extra purchases. I make it a rule not to go into Michaels or JoAnn's unless I have a little extra to spend :) Anyho when I can't craft I do the next best thing organize and make printables. Today I am going to share how I made the printable from the last post Its My Turn to Pick. 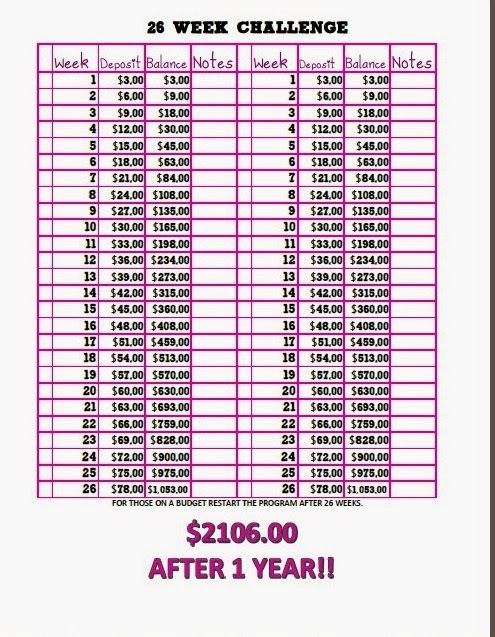 I don't know how many of you use Excel to make printables or just in general but I love it even more than Word. We use Excel at work for pretty much everything and I have become pretty proficient at it! I have found that Excel allows me to move images and clip art around a lot easier than in Word. 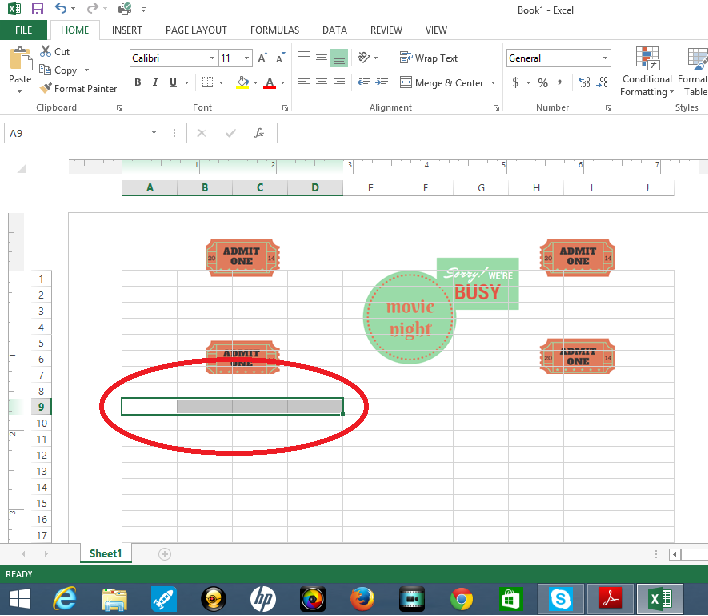 Follow along below with the screen shots to see the various elements of Excel that I used to make my latest printable! To start you will want to create an image for you header. 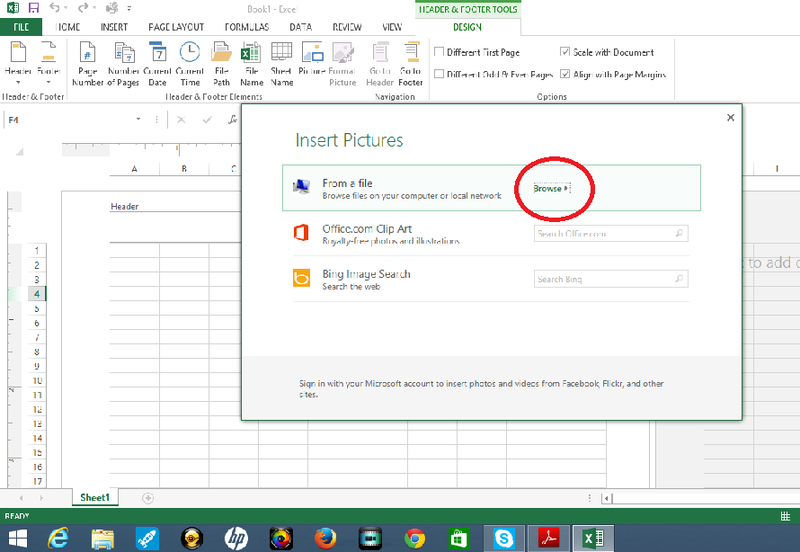 Then you will want to open a blank Excel document. I like to see how everything is going to be laid out on the page so I switch the way my worksheet appears on my screen. To do this click on the View tab and then Page Layout. I have also noticed that you need to adjust that margins a little so that you have an even number of cells on a page. 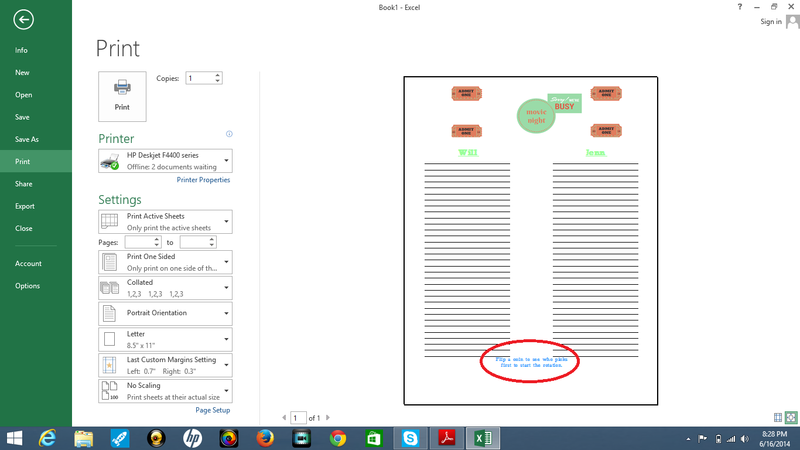 Just go into you page layout tab and adjust the margins to 0.7 for the left and 0.5 for the right. This will then give you 10 columns of cells on the page. I know why is one different than the other. If you play around with the margins you will see what happens. The right and left sides are not equal if you make the margins equal. Next you want to insert the image you created for the header. Click on the text that says Click to add header. You need to select which area of the header you want (center, left or right) and make sure your cursor is in that box. You will notice that once you click on the header portion of the document it adds a new tab labeled Design. This tab will allow you to insert your image. Simply click on the Picture button and then go thru the steps to select the image that you have saved on your computer. Next you will need to resize the image of your Header. If you have created a small image this may not be needed. I created one that I knew would be larger than the normal size of the header. I wanted it to stand out but I still needed to make it a little smaller. This is not hard to do, just click out side of the header box and then click back in so that the picture text is highlighted. Make sure your design tab is still up and click on the format picture button. This will open a smaller box that will allow you to resize the image. Once you have determined what size you want it to be click OK.
You will see from the next screen shot how my header appears on the page. After I inserted my header image I wanted to create two columns where we would each write down a list of our movie picks. I needed one column that had my name and one with his. 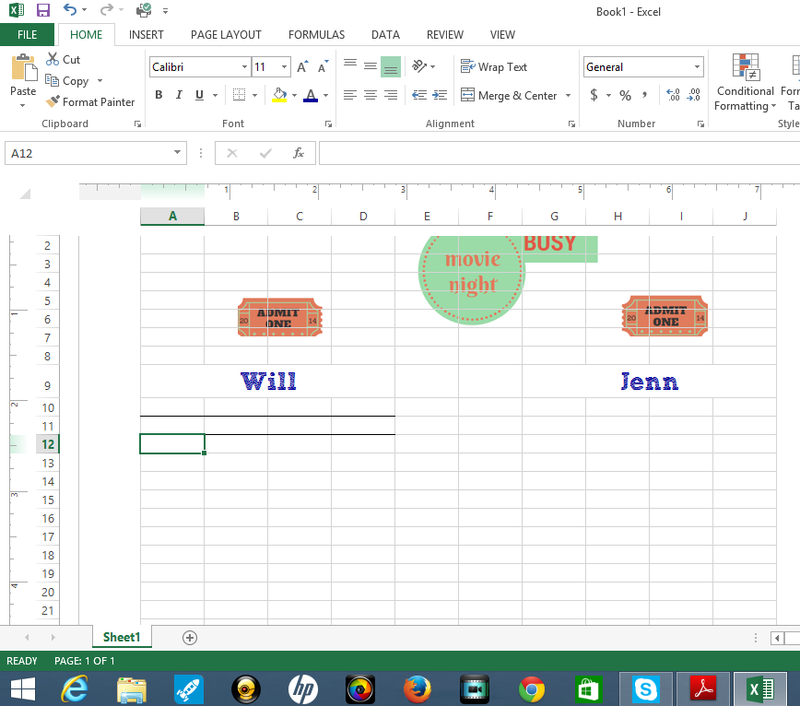 I like things centered so I needed to merge a few cells together to get our names centered where the columns would be. 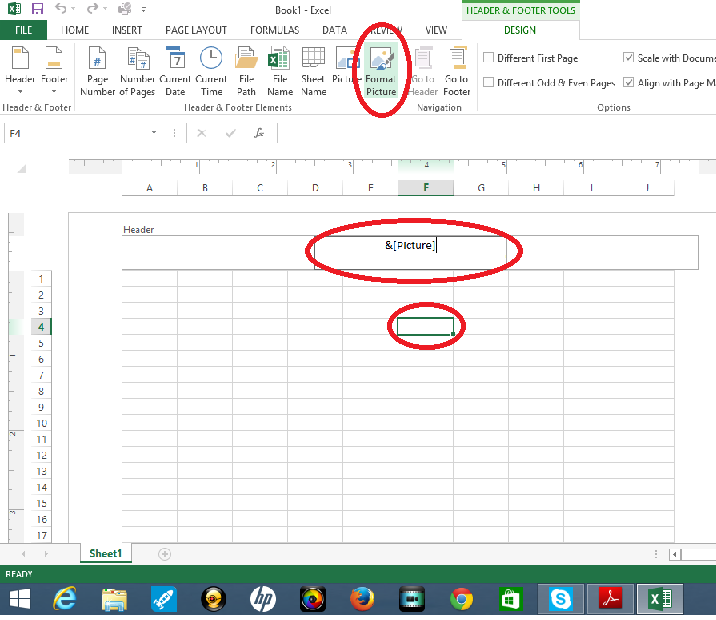 A typical Excel document has nine columns but as we discussed at the begin we want an even number on our page so we have created ten columns for our page. To make things are even I merged the first four columns on the left and then the four columns on the right. This leaves a nice space in the middle of both sections. 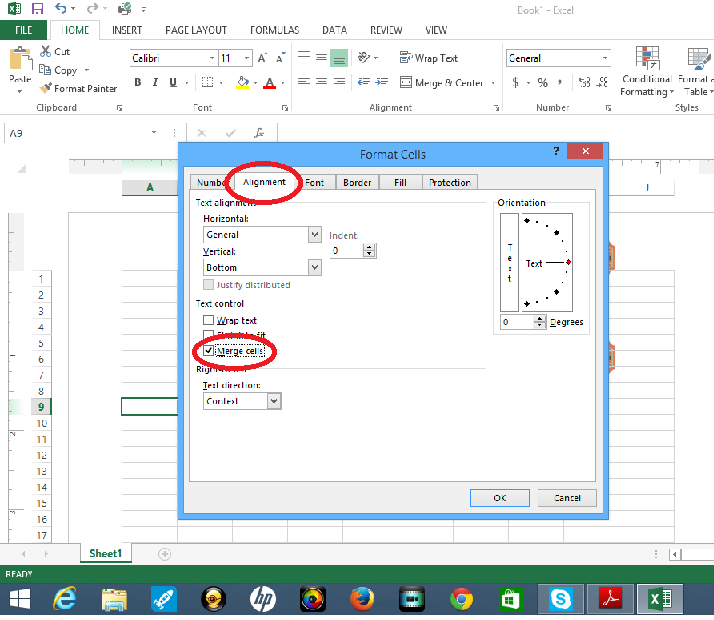 Highlight the cells that you want to merge together and then right click. From the menu that pops up select format cells. This will open another box that gives you a bunch of things that you can do to a cell or group of cells. For what we are trying to do you want to click on the Alignment tab and make sure that the merge cells box is checked, then click OK. 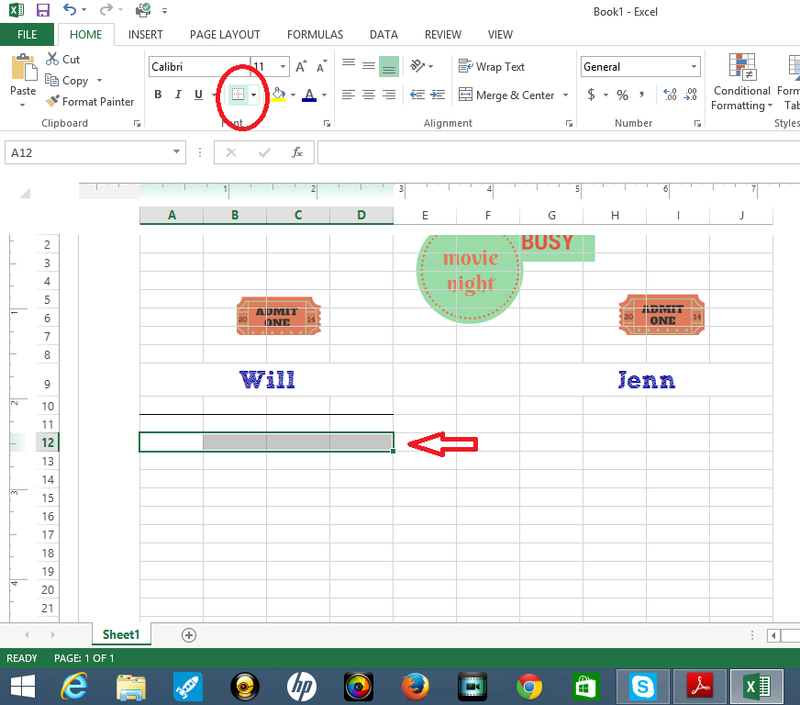 The cells are now merged together and you can insert that text that you want to appear in the now one large cell. 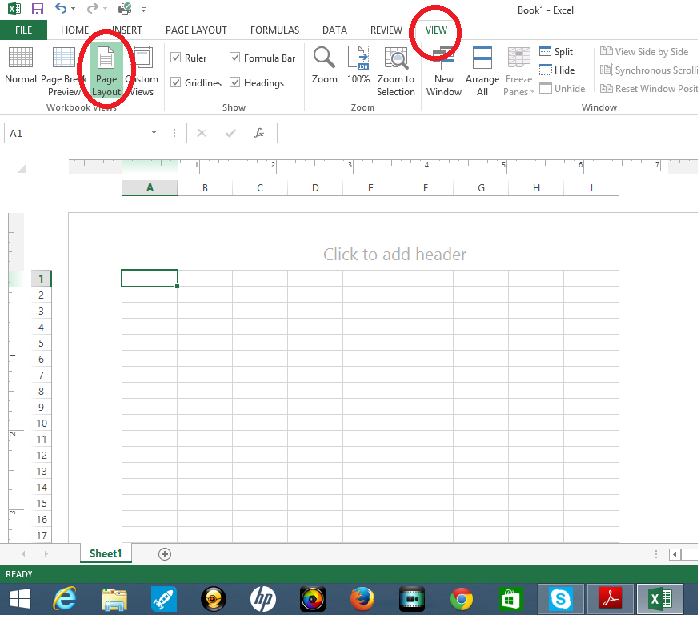 The cell works exactly like a line on a page so you can change the position of the text, center, right, left etc. I did this process twice once on the left for the first column and then again on the right of the document for the second column. To make it easy I want to have the lines appear on my document. This process is done by adding a border. 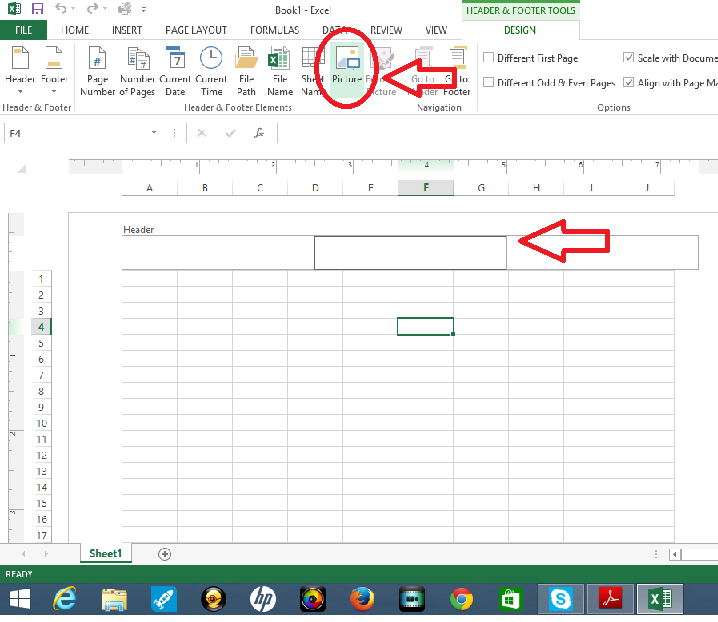 With Excel each cell acts as a "mini page" to create a line across the document you need to have several of these cells highlighted. I highlighted the first four cells on the left and then added a Bottom Border. To add a border you need to click on the box looking button in the font section. 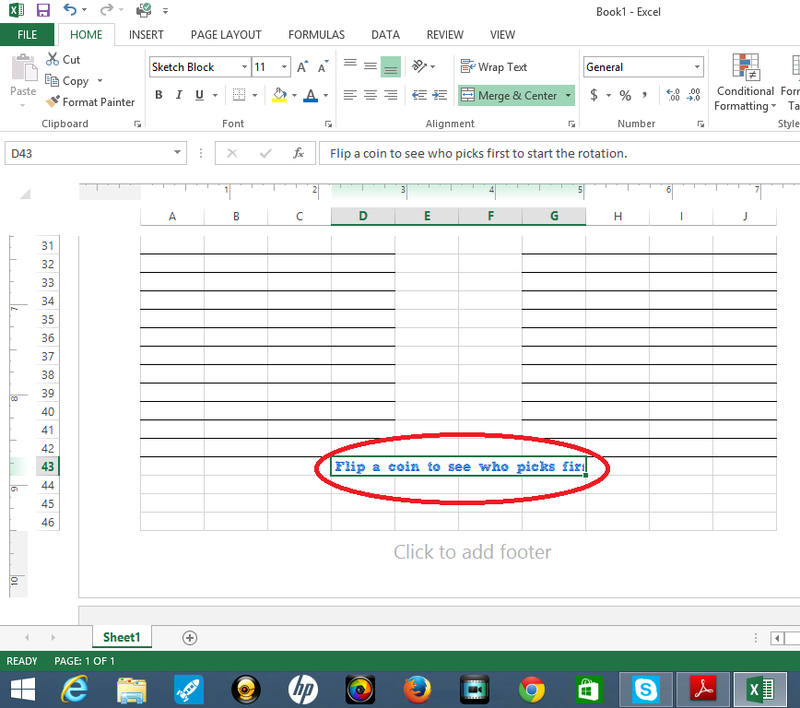 It will drop down a list of different options you have for creating a border for the cell or cells you are working with. The image below shows the first line that I made. I then repeated the process two more times so that I had three lines down the first column. Instead of repeating this process all the way down the first column and then the second I simply highlighted the first three rows and copied them. I then just pasted these same three rows to the bottom of the page on column one and repeated the same for the second column. To finish off the document I wanted to add a little phrase at the bottom that would be centered. To create this I used the same technique of merging cells. Once I had typed in what I wanted to appear I noticed that the text did not all fit in the box. This is simple to fix and only requires a few mouse clicks. You just need to right click, select format cells, click the alignment tab and instead of just having the merge cells box checked you now want the wrap text box check as well. So I had all of this finished and it was time to print. I went into my print preview and noticed that something was a little off. With this final step my document was ready to save and share with you! If you want the free printable head over the the original post here.